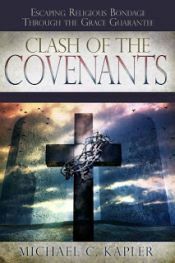 Oftentimes Christian believers are taught to abide by old covenant commandments that were handed down to the Jewish people. By trying to keep these rules and commands it actually strengthens sin and reduces the amount of (good) fruit coming forth. The law brought death, guilt, enmity and it was against us. So what happened after Christ came and died? What relationship do we have to these commandments under the new covenant? The focus is no longer on our good works but it's on Christ working through us. He will bear the fruit. Mixing the law into our new life in Him will produce another kind of fruit that we want to avoid. (which i absolutely love!) then why does Paul talk about running a race...Do you not know that in a race all the runners run, but only one gets the prize? Run in such a way as to get the prize. Everyone who competes in the games goes into strict training. They do it to get a crown that will not last; but we do it to get a crown that will last forever. (1 Cor 9:24-25) That seems like performance to me? Can u help? Tricia, that's a really great question. This is one of those passages that is very often taken out of context (and I admit that I've done it myself). As I see it, it's wrongfully taken as having to do with our performance as Christians. But looking at what Paul says just before verses 24-25, we can see what he's talking about. The context has to do with how Paul has worked hard and has endured much in order to preach the gospel. He first (from verse 3 onward) makes a strong case that preachers of the gospel have a right to earn their living through their preaching of the gospel. But yet, he goes on to say (starting in verse 15) that he himself has not taken advantage of that right. He says, "What is my reward then? That when I preach the gospel, I may present the gospel of Christ without charge, that I may not abuse my authority in the gospel" (v. 18), and he goes on to talk about making himself a servant to all, "that I might win all the more." "I have become all things to all men, that I might by all means save some" (v. 22). This is what he's talking about when he gets to verse 24. The "prize" or "crown" that he's running for is people. Specifically, he's "running" (working hard to present the gospel free of charge to people, and "becoming all things to all men") so that some might be saved. OK...i see what your saying. When i used to go to church it seemed to me like we kinds of did that. We tried to "save" people by trying to get them to join our church. I then when they came the church would give sermons on serving and tithing etc. which indirectly guilted us all into working. I couldn't see how it was a gift. I knew the preachers would say it was a free gift but i really didn't understand it. I agree with Paul that he should be able to earn an income from preaching grace but it seems like many religions don't preach pure grace, it's a mixture. Thanks for your help! You guys are great! Indeed it's so true that many churches entice people to come in with a message of grace and freedom, and then they turn around and stick it to them with all kinds of 'giving' and 'tithing' sermons and performance-based messages. Not that it's a bad idea for believers to give (in all kinds of ways, not just to a church), but these churches do indeed seem to 'guilt' people into it. And to be clear, in my response above I wasn't trying to highlight Paul's words about gospel preachers making their living from the gospel, as I don't think that that's what his ultimate point was, but I had to go back that far in the chapter to set the context for what he was really talking about when it came to the 'prize' and the 'crown' that he was running for. He was laboring hard, not to earn a heavenly prize from God, but to hopefully win people to this glorious gospel of God's grace and peace. So many people preach this passage, ignoring those previous verses, and they turn it into a performance-based teaching that Paul never meant it to be.